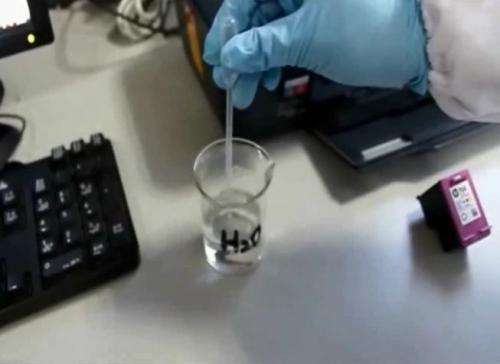 A team of chemists claims their "water-jet" technology allows each page to be reprinted dozens of times—a money- and tree-saving option in a digital world that still relies heavily on hard copy. "Several international statistics indicate that about 40 percent of office prints (are) taken to the waste paper basket after a single reading," said Sean Xiao-An Zhang, a chemistry professor at Jilin University in China, who oversaw work on the innovation. The print fades away within about 22 hours at temperatures below 35 degrees Celsius (95 deg Fahrenheit) as the water evaporates—quicker if exposed to high heat, Zhang and a team wrote in a paper describing their invention in the journal Nature Communications. "Based on 50 times of rewriting, the cost is only about one percent of the inkjet prints," Zhang said in a video on the Nature website. 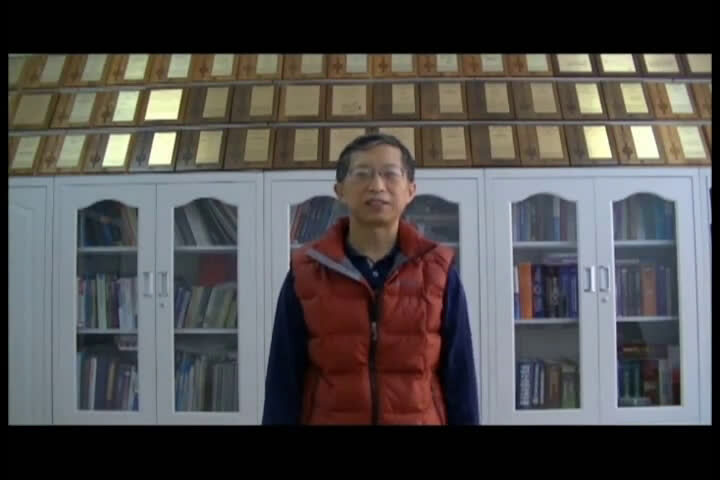 Video of Sean Xiao-An Zhang discussing his work. Credit: Zhang et al. Even if each page was re-used only a dozen times, the cost would still be about one-seventeenth of the inkjet version. Sean said dye-treating the paper, of the type generally used for printing, added about five percent to its price, but this is more than compensated for by the saving on ink. Crucially, the new method does not require a change of printer but merely replacing the ink in the cartridge with water, using a syringe. "Water is a renewable resource and obviously poses no risk to the environment," said the study. Previous work in the quest for a disappearing ink has tended to yield a low-contrast print, often at a high cost, and sometimes using hazardous chemicals. Zhang and his team used a previously little-studied dye compound called oxazolidine, which yielded a clear, blue print in less than a second after water was applied. They have managed to create four water-printed colours so far—blue, magenta, gold and purple—but can only print in one hue at a time, for now. The next step is to improve both the resolution and the duration of the print. They are also working on a machine that will heat pre-printed sheets of paper as they are fed into the machine, fading the pages instantaneously for re-printing. At 70 C (158 F), the colour disappears within about 30 seconds. Zhang said the dyed paper was "very safe" but toxicity tests are underway on mice to be sure. Skip to like 1:30 in the video to get past the intro stuff. And the video cuts out before they even get to the demonstration. Today most of tropical forests is destroyed with planting of biofuels and palms for oil. For me it has no meaning to save few sheets of paper with expensive & toxic dyes and after then burn piles of wood because it's "green" biofuel. After all, the paper is well recyclable "green" material by itself. Next step would be to find a way to treat the paper to fix the print if you decide to keep it. Wood pulp for paper comes from forests in temperate zones. I'm guessing you already know that, but would prefer to post a misleading comment to make some point I oafishly don't appreciate. Expense was quoted at five percent added cost. Toxicity wasn't mentioned, but a cursory search (oxazolidine) didn't show anything. Perhaps you'd care to elaborate. I'd add the environmental cost of producing paper is more than simply cutting down trees. What happens when the average office employee gets a bunch of printout? Before he's through, the pages are full of sweaty and greasy (invisible) fingerprints, visible coffee and coke stains, and they are torn and wrinkled. The cost of having somebody pick only the reusable sheets from the bin, is much higher than just regular printing. This person would also have to pick apart the printer and clean all the rubber rollers inside from dirt and dust, probably once a day. Skip this, and the printer simply jams on every use. But of course, the idea itself is nice and worthy. It could find its usage in some particular applications, for example for labels and reports in hospitals, which must be refreshed periodically on daily basis. Unfortunately such a limited application scope would keep the whole technology considerably more expensive than it could be at wider scale. The contemporary world doesn't prefer these specialties. Great for contracts and any inter-office mail. IOU's would be another great use. There might be other uses for this. This could be the offline version of Snapchat!